Party Members: Carth, Mission, Zaalbar, Bastila, T3M4. Party members will wait for you here when they are not in your party. Locker: Computer Spike x2, Medpac x3. Backpack: Adrenal Stamina, Adrenal Strength, Poison Grenade, Frag Grenade, Blaster Rifle. Appears when Sith Soldier is killed. Dia: Has a side-quest. Can become enemy. Can affect alignment. Zelka Forn: Merchant and healer. Has side-quests. Gurney: Introduces alternative ending to Zelka's Side quest. Bullied Merchant: Can affect Alignment. Party Member: T3M4. Only joins after you talk to Canderous in the Cantina. Usually costs 2000 Credits but can be bargained down to 1500, or if you threaten Janice you can get him for free. Mandatory. Janice Nall: Merchant. Can affect alignment. Sith Guard: Bypassing him is part of the Main Quest. Drunkards x3: Can affect alignment. Can become enemy. Ilthorian and racist children: Can affect alignment. Garouk: Sell pazaak Deck, plays tutorial games. Niklos: Professional Pazaak Player and sore looser. Only plays 5 or 6 times before quitting. Sarna: Off-duty Sith to party with. Canderous: Offers you a way off this planet. Only appears after the swoop race. Duelists: Deadeye Duncan, Gerlon Two-fingers, Ice, Marl, Twitch. Ajuur: Duel Organizer, good source of credits, and can affect alignment. Gana Lavin: Murderous Spoiled Brat. Yun Genda: Off-duty Sith to party with. Enemies: Deadeye Duncan, Gerlon Two-fingers, Ice, Marl, Twitch, Bendak Starkiller. Enemies: Sith Commander, Sith Trooper x2. Disappears when Sith Party is triggered. Can affect alignment. Alien Prisoner: Can affect alignment. Sith Commander Corpse: 25 credits, Sith Armor. Sith Trooper 1 Corpse: Concussion Grenade, Poison Grenade, Adrenal Strength. Sith Trooper 2 Corpse: Sonic Grenade, Adrenal Alacrity. Largo: Has a side-quest. Can become enemy. Can affect alignment. Bouncer: Prevents entrance in Sith Costume, and attacks Vulkars. Hidden Bek Lookout: Prevents entrance in Sith Costume, and attacks Vulkars. Can become enemy. Sith Soldier: You must pass him to continue main quest. Blaster Turret: Instant death attack. Will attack Vulkars. Can become enemy. Gelrood: Pazaak Player. Has infinite cash. Mission: Gives you experience for talking to her. Won't join party until the Undercity. Holdan: Inventor of the Tension Sheet. Involved in Dia's side-quest. Can affect alignment. Bib Surool: Manager for the Starlight Dancers. Lyn Sekla: Auditioning for the Starlight Dancers. You can gain experience by helping her. Zax: Involved in many side-quests, including all bounties, and Rakghoul serum. Can affect alignment. Desk: Datapad. Unnecessary datapad that you can't get rid of. Security Crate: Echani Fiber Armor, 50 credits. Must be opened by solving puzzle. Matrik: Has a side-quest. Can become enemy. Can affect alignment. Sentry Droid: Parts needed: 1 to activate, 4 for weapons, 4 for targeting, 5 for shields, 6 to patrol. Vulkar Encounter x3: See note. The Sealed Strongbox: Blaster Pistol, Republic Mod Armor, 100 Credtits. Must be opened by solving puzzle. Selven's Corpse: Scope, Adrenaline Amplifier, Neural Band. Vulkar Encounter x2: See note. Enemies: Black Vulkar x2 & Vulkar Enforcer. They patrol in a clockwise direction. All the NPC's in this area only turn on you once you side with Kandon and you open one of the security doors. The Bek Guards appear as soon as you side with Kandon. Enemies: Hidden Bek x5, Hidden Bek Guard. Gadon Thek: You must talk to him to proceed with the main quest. Moves if you accept Kandon's proposal. If you side with him and return the accelerator, he will take you to the Swoop Race. Zaedra: Highly protective of Gadon. Can become enemy. Enemies: Hidden Bek x3, Hidden Bek Guard. 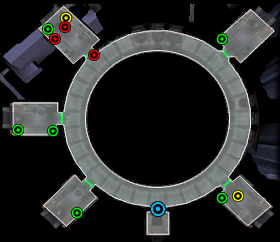 Console: Computer Spikes needed: 2 to Slice, 5 to reveal map. 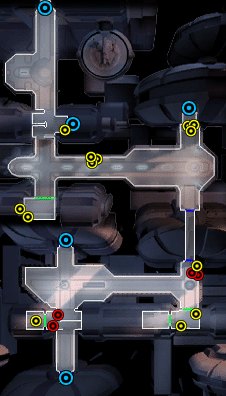 This room is inaccessible in the PC version. Elevator to Gadon's Personal Chambers is in this room. Enemies: Keira, Gadon Thek. Attacking Gadon affects alignment. Rakghouls will respawn indefinitely, however only when the local area has been cleared of Rakghouls. Shaleena: Greets you when you enter the Undercity. Conversation with the bums that you talk to before her can affect alignment. Otherwise useless. Gendar: Leader of this ragtag group. Answers questions for free. Rather useless. Rukil: Has side-quests. Can affect alignment. Igear: Introduces alternative ending to Rukil's Side quest. Can affect alignment. Also a Merchant. Sick villager x2: Has a side-quest. Can affect alignment. Healer: Heals you for free. Hendar: Between a Raghoul and a hard gate. You can save him if you want. He does not affect alignment. Hester: Can affect alignment if you save Hendar. Party Member: Mission. You must let her join to proceed forward with the main quest. Unfortunately Mandatory. Enemies: Sith Patrol Leader, Sith Trooper x2. This battle can be avoided. Sith Patrol Leader Corpse: Frag Grenade x2, Sith Energy Shield, Blaster Rifle, Motion detection goggles, Advanced Medpac. Enemies: Rakghoul x2, Rakghoul Fiend x1. Respawn Point. See note. Enemies: Rakghoul x4, Rakghoul Fiend x1. Respawn Point. See note. Corpse - Sith soldier: Rakghoul Serum, Blaster Rifle, Heavy Combat Suit, Medpac x2, Beam Splitter, Antidote x2. Enemies: 1 powerful Rakghoul if you don't cure the Republic soldier. 4 normal Rakghoul if you do cure him. Minor Frag Mine x4: DC 20 to Disable. 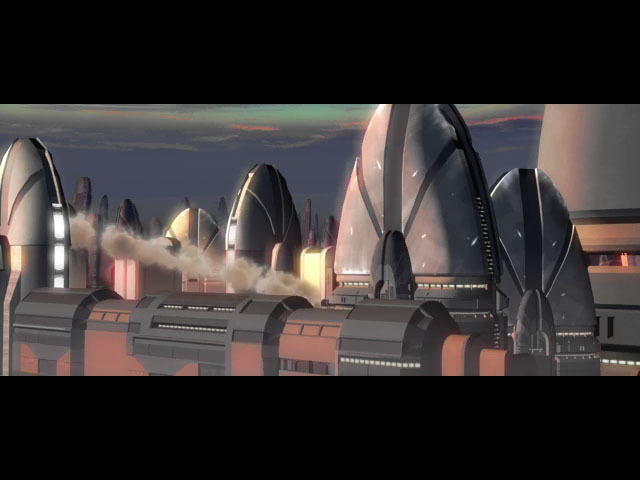 Republic Soldier: Sick lemming-like soldier. Can affect alignment. Canderous: Will help you battle the Rakghoul attack. Enemies: Rakghoul x6, Rakghoul Fiend x2. 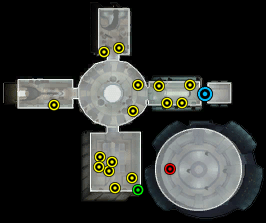 Two Respawn points in the west. See note. Force Field Control: No Computer Spikes. Only Mission can use this. Party Member: Zaalbar. You must find him to proceed with the main quest. Mandatory. Weapons Locker: Frag Grenade x2, Sonic Grenade x2, Stun Grenade x2, Medpac, Scope, Zaalbar's Bowcaster, Pazaak Card ±1, Pazaak Card -2. Enemies: Rakghoul x2, Rakghoul Fiend x1. Enemies: Gamorrean Raider x2, Gamorrean Raid Leader. Enemies: Rakghoul x3, Rakghoul Fiend x1 in the far room. Respawn Point. See note. Enemies: Rakghoul x4, Rakghoul Fiend x1 in the far room. Respawn Point. See note. Enemies: Rakghoul x3-5, Rakghoul Fiend x1 in the far room. Respawn Point. See note. Enemies: Gammorean x2, Rakghoul x3. The Rakghoul will be attacking the Gammoreans. You get xP for any Gammoreans and Rakghouls that kill each other, so you can just stand back and let them kill each other off, until only one or two remain. Enemies: Stampy the Rancor. Immune to energy and ion damage. Melee attacks and disruptors can hurt it. Attacking him in melee is suicide. Frag grenades work best. Vulnerable to force choke. Getting past Stampy is part of the main quest. Disabled Sentry: Parts needed: 1 to activate, 4 for weapons, 4 for targeting, 5 for shields, 6 to patrol. Waitress: Can become enemy. Can affect alignment. 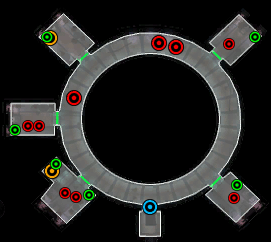 Security Panel: Computer Spikes needed: 2 to Slice, 5 to overload barracks, 8 to disable turrets, 3 to open all doors, 5 to reveal map. Enemies: Black Vulkar. Surrenders. Can affect alignment. Pool Droid: Parts needed: 1 to activate, 5 to crawl into pool. Deadly Gas Mine x3: DC 30 to Disable. Enemies: Defense Turret x3. Insta-kill. Junkpile Droid (Mark 2): Parts needed: 1 to activate, 4 for weapons, 4 for targeting, 5 for shields, 6 to patrol. Junkpile Droid (War Droid): Parts needed: 1 to activate, 4 for weapons, 4 for targeting, 5 for shields, 6 to ram loading bay doors, 6 to patrol. Garage Computer Computer Spikes needed: 2 to Slice, 5 to overload swoop bike, 3 to open security doors, 5 to reveal map. Minor Gas Mine x2: DC 20 to Disable. 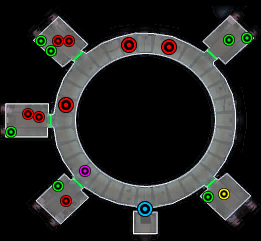 Enemies: Kandon Ark. Kandon's Bodyguard (Female Twi'lek) x1, Kandon's Bodyguard x2. Siding with Kandon will prevent this battle temporarily. You can always return, and battle them sans Kandon. Can affect alignment. If you side with him and kill Gadon, he will greet you when you enter the base and take you to the Swoop Race. Prototype Accelerator: Exactly as it says. Needed to finish non-dark main quest. Enemies: Vulkar Patrol Droid. Combat Droid Level 8 has Carbonite projection unit. Dangerous to solo. Race Announcer: Talk to him to race one of your heats. Redros: If you race for the Beks, Redros will beat your best time once. Anglu: If you race for the Vulkars, Anglu will beat your best time once. Party Member: Bastila. Finding her is the main quest for the first half of Taris. Mandatory. Reception Terminal Computer Spikes needed: 2 to Slice, 5 to overload barracks, 10 to disable assault droid shield, 8 to open elevator, 8 to take turrets offline, 8 to take droids offline, 10 to hack droids targeting, 5 to reveal map. Receptionist Can affect alignment. Can become enemy. Nameless Duros in Trouble Can affect alignment. 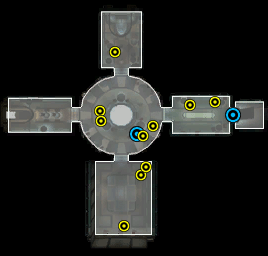 Rusted Sentry: Parts needed: 1 to activate, 4 for weapons, 4 for targeting, 5 for shields, 6 to patrol. If you attack any of the guests while on Davik's Estate, a group of guards from one of the rooms will seek you out and attack you. Rodian: Bug face, who wants to die. Can affect alignment. Can become enemy. Enemies: Bounty Hunter. Battle can be avoided. 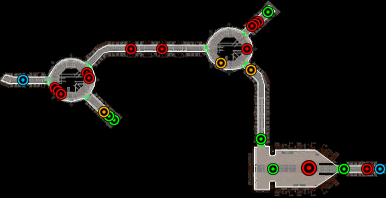 Security Terminal Computer Spikes needed: 2 to Slice, 5 to gas barracks (x4), 3 to open security doors, 10 to disable hangar security, 5 to reveal map. If you have the Computer passcard, access is free. If you talk to Hudrow, disabling hangar security is free, but nets you no experience. Enemies: Bounty Hunter. Patrols hallway. Hudrow: Gives you information to bypass Hangar security. Can affect alignment. Can become enemy. Enemies: Tarisian Noble. Battle can be avoided. He gives you a 5 credit tip if you do. Enemies: Calo Nord, Davik. First "Boss" battle. Davik is weaker, but Calo only needs to be taken down to half. For the amount of build-up, Davik is pathetic. Crime-lord my arse.